Word has just reached Salt Lake that June Mathis, known to nearly all old residents for her wonderful ability as an amateur actress, has become leading woman for the Shuberts in the Eastern Production of “Going Some” the Paul Armstrong-Rex Beach play, which carried New York by storm during the close of last season. Miss Mathis will be remembered for her trips through Salt Lake with Ezra Kendall in an number of plays, but especially for her pleasing work as Polly in “Brewsters Millions” in which, she starred for two seasons. Miss Mathis is with company No 1 in “Going Some” and will not come West this year. Rehearsals have been finished, and the play will open in Atlantic City for a week, when it will go direct to Chicago for an indefinite booking. Later, the company will visit the larger cities of the East. The charming actress has been steadily climbing toward the top of her profession during the last few years and now, less than twenty-two years of age, she has reached a station acquired by but few women the stage no matter of how varied an experience. but in spite of her successes, Miss Mathis is still June Mathis, unassuming, jolly and charming. Now that she has become the leading woman for the Shuberts, she will not be seen by her home people for a year or two, at the least, but many friends will wish her continued success. W.D. Mathis and Miss Laura Mathis of Salt Lake are the father and sister of the rising young actress, and are overjoyed at her latest triumph. 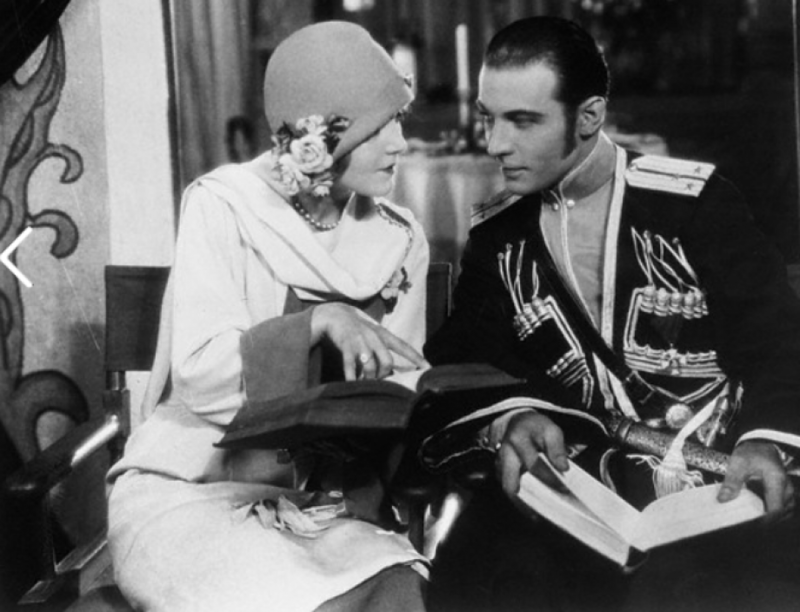 In the heat of discussion about Rudolph Valentino in which everyone who ever goes to the movies seems to be taking part what the man is really like is almost lost sight of in the maze of conjecture, misconception, and exaggeration spread about him. Here he is as he really is. Once upon a time, there was a young man who was not a perfect specimen of American manhood. He was not remarkably dauntless not brave. His appearance did not suggest shining virtue nor impeccable nobility. In spite of the fact that he lacked all the glorious qualities of a real movie hero, Rudolph Valentino went into the movies. The casting director whom he interviewed decided he wasn’t the sort of man who would appeal to an American girl. He did not seem fitted to jump off cliffs, rescue fair maidens, or register high-minded devotion in the close-ups. They admitted however, that he could dance and that he was a good type for what is recognized about the studios, and nowhere else as a “society villain” But they forgot to find out whether or not he could act. Sometimes big movie organizations are careless about such things. I am not, going to tell you about “How One Young Man Made Good” I don’t need to. You probably saw “The Four Horsemen of the Apocalypse” But I am going to set forth my theory of his phenomenal rise to fame, the secret of his success. It is this? He does not look like your husband. He is not in the least like your brother. He does not resemble the man you mother thinks you should marry. He is not the nice boy who takes you to all the high school dances. And so women go to see him in motion pictures because he typifies romance. Out in Hollywood, the men who know him like him. The women who know him but they won’t tell. As for Valentino himself, he doesn’t talk about it. If you happen to be one of those irate fans who have been disgusted with the interviews in which his opinions on love and the ladies have been set forth at wearying length, please accept my word for it that such statements which he really made were wrung from him and that some of them were as new and strange to him when he saw them on the printed page. If he ever saw them as they were to you. Certainly, I found him shy on all such subjects; he honestly does not want to be considered a matinee idol. You cannot blame him, for where are the matinee idols of yesteryear? I have tried to talk to Valentino about love, women and matrimony. Every time, I broached the subjects he side-stepped them. But let us hasten on to the interview. I met Mr. Valentino on the Lasky lot. With me was the perfect Valentino fan when she saw him come up to us both she said “please introduce me by my maiden name and don’t say anything about my husband and baby”. Whereupon she removed her wedding ring, and slipped it into her handbag. There’s a little bit of bad in every good little girl. Mr. Valentino suggested luncheon and escorted us to his motor. “It needs cleaning” he explained “but it runs beautifully”. In half a minute we were a half mile away. When Mr. Valentino made his entrance into the restaurant every woman in sight gave a moan of joy and all the women tourists were oh so glad they had come to California. Mr. Valentino did not look to the left or the right but at the menu card. Our luncheon was the result of a promise. When I saw the preview of “The Four Horsemen” in New York, June Mathis who wrote the scenario came up to me, “Keep an eye on my Julio. I picked him myself and, if he isn’t one of the coming favorites I’ll eat that film”. After the picture, I saw June and congratulated her. So there I became the perfect fan. He found out the perfect fan loved to dance and so he talked about dancing and orchestras and about the charm of sitting in a pleasant restaurant with agreeable and well-behaved persons all about you. He hates vulgarity and vulgar dancing. Then he turned to me and said June Mathis discovered me and gave me a part when life was not so easy. And now, she will write all my pictures. She is a capable, humorous and generous woman. I am eternally grateful to her. No one realizes how much she had to do with the success of “The Four Horsemen” she was on the set every day. She suggested a hundred small touches. And now she will supervise “Blood and Sand”. I am immensely glad because it is the first picture in which I am in the starring role. And I know that I can trust Miss Mathis advice and good judgement. Mr. Valentino was quite sincere. He is not half-hearted about his praise or his blame. Sometimes when it comes to blaming actors, actresses or directors, he refuses to be politic. Who says that the Italian’s are a suave race? But his greatest virtue is his loyalty to his friends. With all the feminine world accepting him as a romantic figure, he refuses to accept his role; his good qualities are commonplace. I said that he evaded discussing love, marriage and women. Yet, I discovered indirectly what sort of woman he does like. During our conversation, he professed an admiration for only one type; he likes clever, sophisticated, amusing and capable women. He has no eyes for the beautiful and brainless. Although he probably won’t admit if he did. I think he rather likes em’ rather strong-minded. No power on earth can make him speak even tolerantly of his picture “The Sheik”. In vain, do you tell him the movie has made money, that brought him stardom, that it is one of the most popular pictures of the year. Mr. Valentino will simply reply the movie was a fatal error and hopes he will never appear in another picture like it. “What nonsense it was. I neither acted like an Englishman or an Oriental” I was obliged to play like an emotional Italian. It was all out of character. The Oriental is stolid and the Englishman prides himself on self-control. “When the picture came out, I received many letters and some were flattering. But the intelligent critics told me what they thought of my acting. They said that Ihat I had achieved a little success and that evidently I was content to take advantage of that success. Letters like that are not pleasant are they? I am not trying to please those who are easily pleased. I value the opinion of the intelligent critics. This maybe a blow to the Valentino fans, but he honestly dislikes silly letters. “Just now, I need honest criticism and good advice, I appreciate it. Again, Mr. Valentino seemed sincere. Success has made him sensitive and hypercritical of his own work. He is not vain but shrew and careful minded that he takes his popularity with large grains of salt. “Hollywood” said Valentino is a small town not physically but mentally”. A great deal has been said about the frivolous of the movie colony. All of us need honest recreation. We need to forget the studio when our work is finished. I like to dance and I like to go to restaurants with my friends. But I don’t like vulgarity in dancing and so-called wild times I have seen in the cafes in Los Angeles were rather childish and silly. Several years ago, New York had become a delightful and cosmopolitan city. Out here we have to still learn how to amuse ourselves. One cannot escape boredom merely by going out and spending allot of money. No reformer is needed to tell the better-class actors and actresses that they cannot enjoy themselves merely by going out and drinking too much. I am afraid, I have made Rudolph Valentino a serious young man. Most of the time he wears a mask, and he uses his charming manners as a sort of guard. He has no particular pose; he is a dignified and courteous gentleman and is witty in a sharp way. When he spoke of the conventional “happy ending” to movie stories the perfect Valentino fan hung on his words. “The happy ending” has come to be nothing but a rubber stamp. I think the public is tired of it. After all, only one love affair in a thousand ends happily. And an affair of that sort is too dull to be interesting. Romance doesn’t make men and women happy. Human beings are made happy by such things as success, food, a good home, pleasant friends. Romance is something that makes them more than just happy. A refutation of the Pollyanna philosophy. Love doesn’t make the world go round it makes it go sidewise, zigzag, up and down and backward.. In his attitude, toward his art, he reminds me of the adored Caruso. When Caruso made a sensational success in opera, the wise men said that he couldn’t stay a public favorite. Caruso remained a favorite until he died. Valentino and Caruso are much alike in their way of talking and speaking. Caruso was supposed to have a wicked voice whatever that means and Valentino is supposed to have wicked eyes. At heart, Valentino is the same as Caruso and one of the most interesting things about him is the violently contrasting opinions in the outbursts of feeling that his sensational success has caused. If you’ve been reading ‘What the Fans Think’ you know what I mean. I know of no one in pictures the mention of whose name will start so violent a discussion. Hazel Shelly told you, last month that he was vain, calculating, and upstage. She refused to meet him. Hazel is entitled to her opinion, but you missed the chance of your life. Years from now, you’re going to sit down and cry about it. Ethel Sands gave a good impression of him thoroughly honest and to my mind accurate. And now, having given my own appraisal, I wish to add the opinions of some of those who have worked for him. June Mathis “I have worked with Rudy a long time. I can assure you he is a nice boy. He has been the target of professional jealousy. He has kept his head and his temper. He is reasonable and not all temperamental. After finishing “Blood and Sand” Nita Naldi discussed Valentino. “When I came out here, I did not think he could act”. Now I apologize. He is a real actor and I suppose some of our love scenes will look pretty warm. The script called for them. Valentino was courteous and decent. Some actors and I have played with prominent ones like to spoil the scene by putting in little asides. Valentino does not. Said Lila Lee “Blood and Sand” was a real inspiration. Imagine Fred Niblo, Valentino, and June Mathis working on the same picture. Valentino sn’t a bit mean about wanting the star part. Mrs. Mathis “we are all fond of Rudy. I like an accomplished man. He speaks five languages and plays and sings beautifully. The perfect Valentino fan ended up the chorus “I would leave my husband for him but I am afraid I would annoy him.” Mr. Valentino is a wonderful relief he doesn’t flirt, he is quite sincere. By the time you read this you will have known for some weeks that Rudolph Valentino is married again. The lucky lady is Natacha Rambova alias Winifred Hudnut. Valentino’s opinions on his marriage are sound: “it will be the best thing in the world for me. I shall have a clever wife to advise and encourage me. I know that I shall be very happy we have the same friends and same tastes.” Both Natacha and Rudy will be the most charming couple in Hollywood. They have established their own intellectual circle, and they are far from the mad movie set. Is she jealous of his leading women? I don’t think so. She merely smiles as Valentino bows to his favorite heroine. It is easy for a woman to fall in love with her man, but it is hard for her to gain his respect and devotion and this Natacha Rambova alias Winifred Hudnut has done. June Mathis the scenarist who discovered silent film star Rudolph Valentino, is buried next to him in Hollywood. She secretly arranged it that way. If allegations in litigation are correct. Mrs. Millie Hawkes of New York at 85 bobs and dyes her hair, has 50 pairs of shoes and five fur coats. She is the mother of the late June Mathis, scenario writer, and is suing for half of an estate of $50,000 under an undated will. Silvano Balboni, her son-in-law avers he is maintaining her in luxury. Mrs Hawkes says your never too old to continue looking your best. Following the death of his wife June Mathis, five years ago. Silvano Balboni returned to his native Italy to produce films. But he is back now to supervise the technical details of Edward Small’s picture “The Melody Lingers ON” which has an Italian locale, and he intends to remain. Balboni started photographing movies in 1910 – he is 40 now and later he directed several pictures here and in England. While working in London, he induced a young stock actor to try the films. The actor was Ronald Coleman, Miss Mathis was a noted scenarist and the discoverer of Rudolph Valentino. The entire $100,000 estate of the late June Mathis, prominent scenarist, will go to her husband, Silvano Balboni, motion picture director, under a decision filed today in Judge Crail’s court. Balboni’s attorneys stated the director would care for Mrs. Millie Hawkes, 85 grandmother of Miss Mathis, who lost a life interest because she contested the will. Last year, Mrs. Hawkins sued the director in court for $50,000. The director in-turn told the court she already lives in luxury with five fur coats and 50 shoes. Also, discovered during the contest that the will bore a printed dateline and was therefore, not entirely in Miss Mathis’ hand. ON this ground the will was declared void and the husband was made sole beneficiary. Buren, John Sainpolis, Nigel de Brulier, Virginia Warwick, Derek Ghent, Stuart Holmes and Edward Connelly. SL Rothafel and his staff are at work on the details of a presentation in keeping with the production.